The London Eye (also known as "The Millennium Wheel") is a large Ferris wheel located in Jubilee Gardens on the South Bank of the River Thames in London. 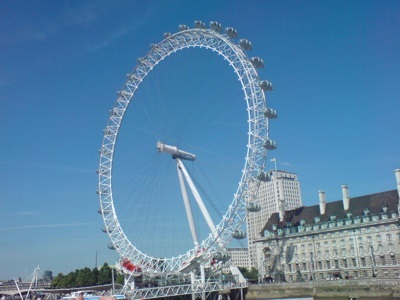 The London Eye is in fact the largest Ferris wheel in Europe. It stands 443 feet (135 meters) tall. Visitors to the London Eye, ride in enclosed air-conditioned capsules, and can get a spectacular view of central London. It takes about half an hour to complete a rotation. Sweeping one of the world's most famous skylines at 135 metres in height, the London Eye is the largest observational wheel in the world, and provides a spectacular 30 minute 'flight' over the capital. But if it had not been for the vision, commitment and sheer persistence of David Marks and Julia Barfield, the husband and wife team of architects behind the project, the London Eye might never have been built. Eye tells the various stories behind the conception, development, realisation and construction of the capital's newest landmark, including personal and political dramas, corporate conflicts, doubts, risks, obstacles and accidents. Against the backdrop of New Labour's pre-millennium Britain, prominent public figures attacked and defended the project, there were unprecedented design and construction problems to overcome, and Marks and Barfield had to fight every inch of the way to maintain the integrity of their vision. This seminal moment in British architecture is celebrated through the dazzling photography of Marcus Robinson, insightful writing by The Guardian journalist Steve Rose, with an introduction by Richard Rogers and the clean and modern design of Neville Brody's Research Studios. All aboard the London Eye! Europe's tallest observation wheel gives visitors a bird's‑eye view of the city's landmarks. Learn how the London Eye has quickly become a beloved landmark as you model odd and even numbers. This nonfiction math reader builds literacy skills and math content knowledge, combining informational text, problem-solving, and real-world connections to help students explore math in a meaningful way. The Let's Explore Math sidebars feature clear charts and diagrams that make learning the concepts easy and fun. The Problem Solving activity enhances the learning experience and promotes mathematical reasoning, and the Math Talk section provides critical thinking questions to help facilitate rich discussions while developing students' speaking and listening skills. Text features include content-area vocabulary, dynamic images, a table of contents, a glossary, an index, and an answer key. Aligned to state and national standards, this high-interest title will engage students in reading and learning. and see the London sights with us. At any time, hop off, explore! As a family of four spend a day exploring London, fun, child-friendly poems introduce readers to our wonderful capital city, and all its secrets. Well-known landmarks like Buckingham Palace, Big Ben and the London Eye, plus inescapable features like rain and taking tea, all get Patty Toht's witty treatment. Non-fiction facts provide more information about the poetry subjects, while rising star Sam Usher brings them to life with his signature style and humour. This gorgeous celebration of London will be loved by both tourists and those who call the city home.